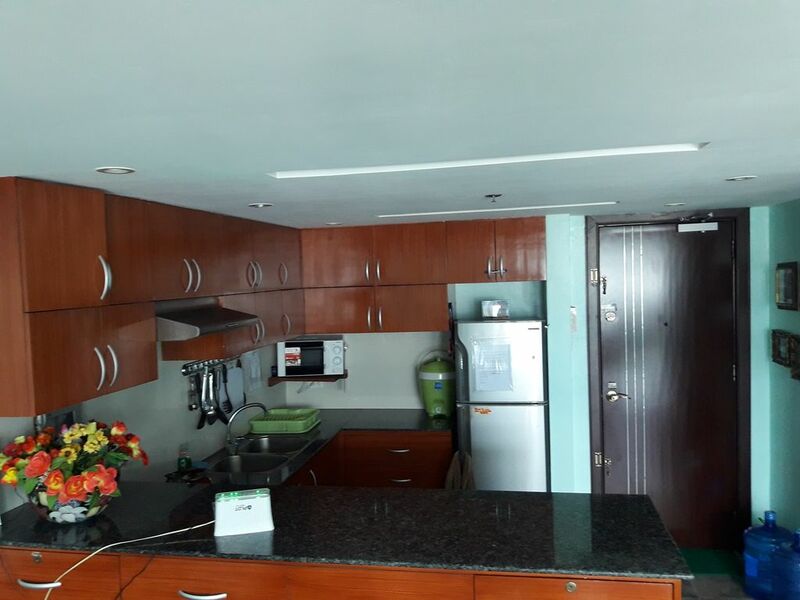 This 2 bedrooms 2 full baths condo is centrally located in Fuente Osmeña Cebu City.Just walking distance to Robinson's Supermarket and department store.Walking distance to Chong Hua Hospital,Cebudoc,Vicente Sotto,Velez,Visayas Community.A short drive to Ayala mall and SM malls.Close to Ferry Terminal and Southbus terminal. Accesible to all public transportation buses and Jeepney's,taxi's are running when you go outside the building. Beautiful, relaxing mountain view 2 bedroom, 2 full bath, fully furnished condo with fully equipped kitchen. Features: Large Screen HDTV with +-- ---- ---- movies, TV episodes, NETFLIX and cable channels. Music system in bedroom. This unit's special feature is an American style fully equipped kitchen with large amounts of twinkling Blue Pearl granite wrap around counters and a bar that seats four. Chat and entertain your spouse / guests while you prepare a gourmet meal with a 15th floor mountain view backdrop. American style quality and functionality with American style floor to ceiling wood cabinets, and large service drawers. Wood dining table with 6 chairs; fully equipped kitchen with microwave, oven-stove, Samsung frost free 2 door refrigerator, and automatic washing machine with turbo dry. Pressure cooker (low power again! ), pots, pans, dishes, all utensils; pillows, linens, towels. Imported European designer tiles throughout with attention to placing non-skid tiles in baths. There is a desk with office swivel chair, and a computer desk. Master bedroom has lots of built in shelving and a walk in closet. Beautifully furnished with premium reclining sofa. This unit is designed for super low electricity consumption with 3 top of the line, high efficiency Panasonic Premium model "split" Inverter air conditioners with independent controls ( few apartments have this! ), double foil wall insulation, LED lighting, as well as "on demand" German AG hot water heaters for additional savings! Fully equipped entertainment center with large screen HDTV with hundreds of cable channels accessible, as well as Netflix and the best high speed PLDT internet; DVD player & Karaoke. We love music and have 3 high quality music systems. Club Ultima high-rise condo residences, 3 joined tower complex located in the heart of the City Centre at Fuente Circle Osmena Blvd. All the roads fan out from here to go anywhere in the city. Ultima Residence 3 is a highly secured building with guards on staff 24/7 and video intercom for additional convenience and security, as well as 24 hour concierge, room service, 24 hour convenience store, interior taxi pickup without leaving the building! Four restaurants, full spa, gym, covered lap swimming pool, There are also zip lines between towers, an "edge coaster" and a climbing wall. There is a children's play area, miniature golf, cinema, library, business center, conference rooms, salon, massage spa, and even a shooting range all located within the complex and all accessible without leaving the complex. Hello, I am Janice! I am a Filipina. I like to speak different languages. I like to cook and I like music. I enjoy hosting because it offers opportunity to make new friends and meet people from different cultures. I love to help new visitors to discover the wonderful things we have to offer in our City and enjoy the wonderful Filipino culture.